Have you been thinking and thinking about signing up for my amazing all-inclusive culinary retreat weekend in Vermont next month? Well you're still in luck, but it's definitely time to pull the trigger. There are only TWO tickets left to this very special weekend adventure and they are going to sell out. If you've been dreaming about joining us, now is the time! 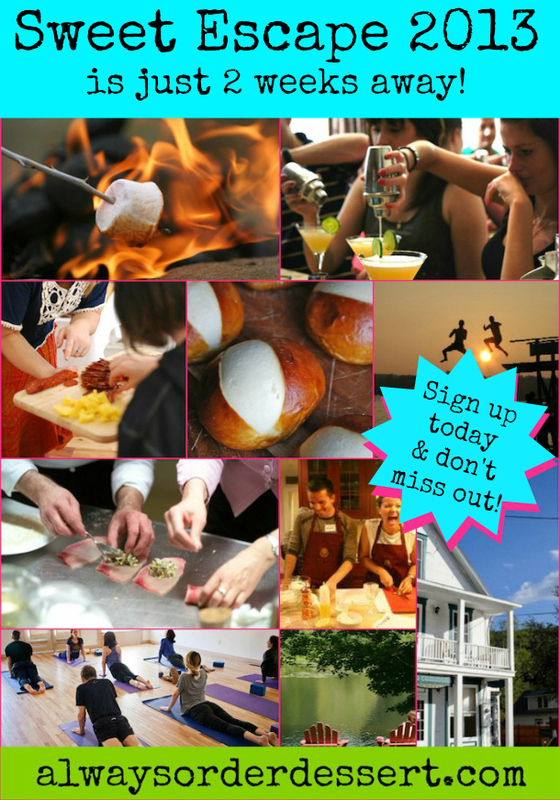 Click here to register today and you'll get to take part in all that we have planned, including hands-on cooking demos, cocktail and wine workshops, excursions to visit local farmers and cheese producers, wonderful gourmet meals served family style on the long farmhouse table, crafts workshops, daily yoga classes, an in-house massage therapist, evening dessert experiences, a food-themed movie night, and SO MUCH MORE! Remember that this is all-inclusive, so the $695 ticket gets you round-trip transportation from NYC, lodging in shared double bedroom, all meals, workshops, events, and one amazing goodie bag filled with surprises to take home! If you have any questions at all about this weekend or the registration, just email me. I want everyone who wants to come to be able to make this happen, so let me know what I can do for you to make this possible. Seriously--just ask! Lots of love & I can't wait to share with you in just 2 short weeks!